Earlier this week I took a look at some of the battles set to be decided at this weekend’s all-important Gdynia Open event, which is now underway with its amateur rounds having started yesterday. Tomorrow though sees the entrance of the professionals and with tour cards, Grand Finals spots and Grand Prix places up for grabs, click below for my rolling blog which will be updated throughout the next three days, flagging up the matches and results to keep an eye on and setting out those currently in position to retain a tour card through this list. In addition to these players, there are others who are currently just inside the top 64 on the two-year ranking list, who will have an eye on this tournament as a safety net, in the event that they slip out of the top 64 between now and the end of the season. These include (with their European Order of Merit totals): Nigel Bond (2,749), Tom Ford (583), Jamie Cope (4,332), Alfie Burden (1,166), Li Hang (583), Cao Yupeng (583) and Peter Lines (2,000). 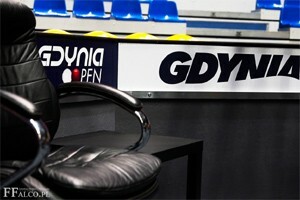 9:51 – Good morning everyone for the final day of the Gdynia Open, as we will learn the identities of the 32 players who will contest the Players Championship Grand Finals, as well as the new World Grand Prix next month. 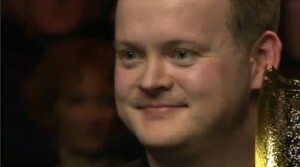 10:13 – Shaun Murphy is the first winner of the day, but the first significant result in terms of the various ranking lists is a 4-0 win for Robert Milkins against Dominic Dale, which means that Dominic now cannot improve upon his position of effectively being 23rd of the 24 potential qualifiers for the Grand Finals from the European Tour list. Whilst being potentially bad news for Dominic, this will come as something of a relief to the likes of Chris Wakelin and Mark King above him, who now look to be increasingly certain of their own positions. For Milkins of course, good news in his own battle to reclaim a top 16 seeding ahead of the World Championship, as he continues to slowly reel in Stephen Maguire, who lost to Ross Muir in the opening round here. 10:31 – Following Dominic out of the tournament is recent Welsh Open winner John Higgins, who has lost 4-2 to Judd Trump on the televised table this morning. The means that John must now hope that neither David Gilbert, Liam Highfield or Stuart Carrington makes the semi-finals. 10:54 – Finishing with a century break, Mark Williams is through to the last eight with a 4-2 win against Liam Highfield, who cannot now qualify for the Players Championship Grand Finals. 11:07 – A good 4-2 win for Jimmy Robertson against Martin Gould this morning keeps his hopes alive of claiming a place at the new World Grand Prix., with a run to the final needed if he is to steal the place from Michael Holt at the last. 11:26 – Victory for Joe Perry against David Gilbert means that another chaser drops out of the running for both the Grand Finals and Grand Prix spots, with Gilbert now unable to break into the qualification places. 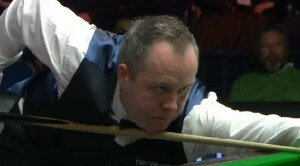 11:56 – And with defeat for Stuart Carrington against Luca Brecel, the race for Grand Finals places looks to be all over, with John Higgins holding on to the final place through the European Order of Merit that he took last night with his win against Mark Joyce. The last remaining theme to keep an eye on then is whether Jimmy Robertson can overhaul Michael Holt in the race for a place at the World Grand Prix, with a run to the final from him needed to do so. 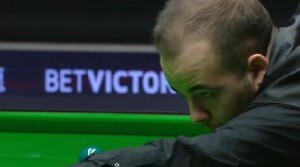 Luca Brecel will be his quarter-final opponent. 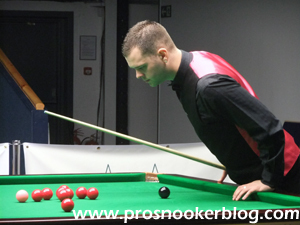 16:07 – Michael Holt can breathe easily now, thanks to his mate Mark Williams who has defeated Jimmy Robertson 4-0 to make it through to the final in Gdynia. The result means that Robertson just falls short in his bid to make it to Llandudno, finishing 34th on that list. 0:04 – Good morning all and yes you have read that right, I have posted the first entry of today’s live blog at just gone midnight as whilst taking a look at tomorrow’s schedule to see who is playing in the morning, I have noticed that defending champion Shaun Murphy has an opening round bye against Welsh youngster Jak Jones. 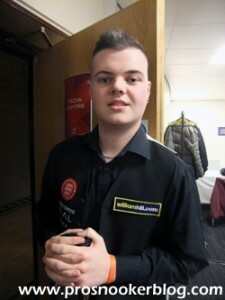 This is of course significant because as you will note from the list above, Jak was the closest chaser to James Cahill for the final main tour spot as it stands and therefore his withdrawal for whatever reason is another significant boost to James, who following defeats for Alex Davies and Elliot Slessor yesterday, continues to hold onto eighth place on that list. 10:25 – With the weekend action now well underway, already there are a few notable scorelines with defeats for Andrew Pagett and Allan Taylor meaning that they now cannot add to their tallies in the race to stay on tour. Also in action now is amateur Paul Davison, who along with Adam Duffy must win two matches today in order to come into contention to earn a two-year tour card. It has been a good start to the morning for Duffy in fact as he has taken the opening frame of his match against Neil Robertson, the Australian apparently having arrived late for the match. It is an important match for Robertson too, as he currently stands to take only the 23rd of the 24 places on offer for the Grand Finals this weekend. Of those who might catch him and currently 24th placed man Michael Wasley, Jamie Jones, Joe Swail, Dechawat Poomjaeng and Dominic Dale are all in action today. 12:10 – From 3-0 down against Dominic Dale, Paul Davison has fought back to force a deciding frame and at the time of writing, keep his hopes of earning a return to the main tour from this Order of Merit alive. 12:46 – It was a strong comeback, but Paul Davison cannot win the decider against Dominic Dale, meaning that he will have to look for an alternative route back onto the main tour for next season if he is to make it. 12:54 – Which is won by Robertson on the blue, the Australian giving his hopes of a place in the Players Championship Grand Finals a boost, moving up above Fergal O’Brien amongst others. For Duffy though, it means that he will not gain a main tour place through this list and James Cahill can rest a little easier. 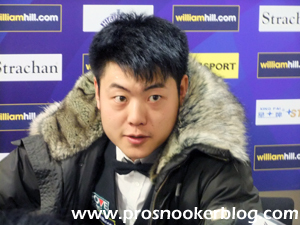 He is not guaranteed to remain on your yet, but it is another good result for the man who defeated Ding Junhui at the UK Championship earlier in the season. 13:38 – Another man through to the last 64 is Chris Wakelin, who not only is the highest player of those looking to earn a tour card via this route, but is also well in contention to earn a place at the Players Championship Grand Finals next month. 14:48 – Updates are a little slower today relative to yesterday so far with fewer matches having an impact upon the various battles, but that will change this afternoon with lots of results potentially able to affect the Grand Finals race. One of them is a 4-1 win for Jamie Jones this afternoon against Ian Burns, which means that he now needs to defeat Mike Dunn to put himself above Michael Wasley as it stands and move up into position to take a spot in the Players Championship Grand Finals in Thailand. 15:48 – It always looked like an outside chance as required a quarter-final to earn a tour card, but Gareth Allen has fallen at the last 64 stage, losing out 4-0 to the experienced Scot Alan McManus this afternoon. That means that to all intents and purposes, the battle for tour places has been largely settled in Gdynia, with James Cahill hanging on in eight place as it stands. There can of course still be changes between now and the end of the season, but it will depend upon just who is able to finish up inside the top 64 on the main two-year ranking list after the World Championship. 15:56 – Through to the last 32 is Welshman Dominic Dale, who like Michael Wasley now requires just one win to move above Michael Wasley in the European Order of Merit and potentially into play for a place at the Grand Finals. Michael White or Craig Steadman will be next up for him. 16:20 – Graeme Dott defeats Mark King 4-1 to progress to the last 32, meaning that while King currently sits well placed on the European Order of Merit to qualify for the Grand Finals, he cannot now add further to his tally this weekend. 16:57 – Another player consolidating his position inside the Grand Finals places however is Marco Fu, who has edged out Chris Melling in a deciding frame to reach the last 32. 17:33 – Following his dramas this morning, Neil Robertson has now enjoyed a more routine victory against Anthony Hamilton in his second match to in all likelihood make sure of his place at the Players Championship Grand Finals now. Unusually, he won the first frame by 152-0, a total clearance of 137 following 15 penalty points to get him off the mark in style. 18:43 – Oliver Lines has come back from 3-1 down this evening to defeat Dechawat Poomjaeng in a deciding frame and move into the last 32. Unfortunately for Dechawat, this means that he will not qualify for the Grand Finals, which of course will be played in his home country, Thailand. 19:15 – But no longer, as Dominic Dale defeats Michael White 4-1 to progress to tomorrow’s last 16 stages and in the process, move above Michael Wasley and Fergal O’Brien in the European Order of Merit. 21:36 – And with a break of 83 in the deciding frame, Higgins does defeat Mark Joyce to potentially sneak into the Players Championship Grand Finals, edging out Fergal O’Brien. So with just one match to conclude this evening between Matt Selt and Oliver Lines, what is still to be decided tomorrow? This battle is all done in Gdynia as far as the race for tour spots is concerned, with James Cahill hanging on to the eighth spot as it stands. Again, there may yet be changes in the main two-year list between now and the season, but nobody remaining in the tournament can now change the running order as it stands. A point of clarification too as a lot of people have asked why I haven’t included Sean O’Sullivan above. This is because he qualifies via the Asian Order of Merit, having already finished high enough up on that list, due to that series having finished first chronologically. Following his victory against Mark Joyce this evening, John Higgins holds the 24th and final spot available from the European Order of Merit, level on points with Dominic Dale who stands above him on count back. So who can still get in on the act? 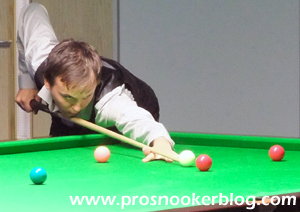 David Gilbert is the closest, but must win at least two matches and make it to the semi-finals in Gdynia. The same applies for Liam Highfield and Stuart Carrington. Most vulnerable aside from Dale and Higgins are perhaps Mark King and Marco Fu, who are already out of the tournament, but it would require a number of results to go against them for them to miss out. Following Fergal O’Brien’s defeat yesterday, Michael Holt remains in the final qualifying spot for the World Grand Prix and will remain there, unless either David Gilbert or Jimmy Robertson can reach the final. Both in the same half of the draw, only one of them can do so, while the likes of Liam Highfield, Stuart Carrington and Oliver Lines are too far back now to threaten Holt. 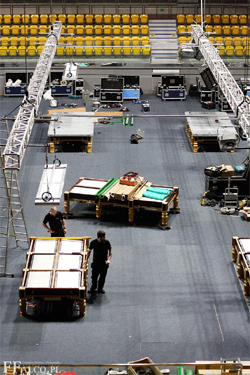 9:30 – Good morning all as the opening session of the professional stages of the 2015 Gdynia Open is now well underway. Judging by players tweets on Twitter, it sounds like a number of players are experiencing problems getting to the venue due to fog, although all scheduled matches seem to have started so far. In respect of the battles mentioned above, there are already a couple of significant points to note, with James Cahill now 3-0 down to Tom Ford in his opening round match. 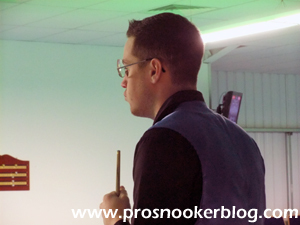 If Tom can win one of the remaining four frames, then Cahill will find himself vulnerable in terms of retaining a top eight place in the list above. Elsewhere, Lee Page leads Mark Williams 2-1 as he bids to keep alive his slim hopes of retaining his tour place through this list, while for Williams a win could also be important as he looks to secure a place at the Players Championship Grand Finals, currently sitting in 22nd place on the latest Order of Merit. 9:44 – Despite having experienced a difficult season up to this point, Tom Ford has now completed a 4-0 win against James Cahill to land a significant blow to Cahill’s hopes of retaining a tour place for next season. Cahill will now be looking at the results of Elliot Slessor and Stuart Carrington immediately behind him, who both play against amateurs later on today and hoping that one of those amateurs can cause an upset. 10:08 – David Gilbert is now underway against Jason Tart, Gilbert one of the players who needs a run to the final in Poland if he is to claim a place at the new World Grand Prix next month. The player in with the best chance of gatecrashing the current top 32 on that list is Fergal O’Brien, who plays Lyu Chenwei later this morning. 10:23 – The man currently in possession of the final spot at the World Grand Prix is in fact Rod Lawler, who currently finds himself level at 2-2 with Ali Carter. 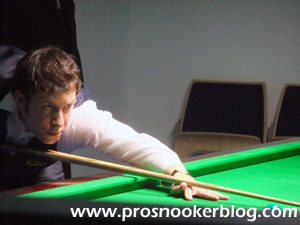 Defeat for Rod would mean that O’Brien could pass him with two wins in Gdynia today. 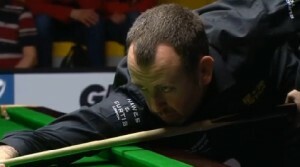 10:49 – Mark Williams defeats Lee Page 4-2, thus ending the outside chance of Page retaining his tour status through the European list. For Mark though, victory moves him up from 22nd to 18th place on the list, boosting his hopes of a place at the Grand Finals in Thailand, as well as at the Crucible from the main ranking list of course. 11:13 – A 4-2 win for Rod Lawler against Ali Carter could be a decisive boost for Rod in his chase for one of the 32 spots at the World Grand Prix. 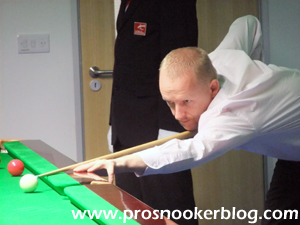 Having come into this event occupying 32nd spot on that list, Rod now moves up above both Luca Brecel and Michael Holt, while 33rd placed Fergal O’Brien would not have to win three matches to overtake the man from Liverpool. 11:26 – Marcus Campbell is another man through to the last 64 with a 4-2 win against Welsh Open quarter-final Gary Wilson this morning. For Marcus while the majority of lists will most likely prove irrelevant, he needs to win as many matches as possible at the moment if he is to remain in contention to retain his top 64 place at the end of the season. 11:35 – Amateur Mitchell Travis is one of three players who can now tie with James Cahill with a last 32 run this weekend and he is now underway in his opening match against Martin Gould. If Mitchell were able to win two matches today, he would finish above Cahill on countback, having enjoyed a better result at the most recent European Tour event. 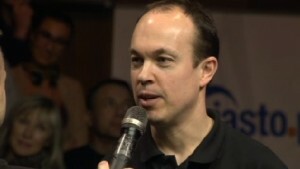 Also in action now is Fergal O’Brien, who is chasing a place at the Grand Prix and also the Players Championship Grand Finals. 11:49 – Elliot Slessor is a frame to the good in what could be a crucial opening round match for him against Marc Davis, as he looks to take advantage of that defeat for James Cahill earlier in the day and earn a fresh tour card for next season. 12:31 – A 4-2 win for Robbie Williams against Thomas Dowling, a clearance of 73 in the final frame from 71 behind enough to secure victory. Robbie is another player who with a good run in Poland could bring himself into contention for a place in the Players Championship Grand Finals. 13:09 – A useful 4-0 win for Luca Brecel against Hammad Miah, which moves him up from 32nd place to 30th on the World Grand Prix list, as well as from 20th to 17th on the European Order of Merit, boosting his prospects of being in the Grand Finals. 13:14 – With his 4-0 victory against amateur Mitchell Travis, Martin Gould has put Travis out of the running for a tour card via this list, while Elliot Slessor is locked at 2-2 with Marc Davis in what could be a crucial match for him. 14:02 – A big win early this afternoon for Ireland’s Fergal O’Brien, who defeats Lyu Chenwei 4-1 to progress to the second round. The results keeps alive his hopes of a place at the Grand Prix, with two more wins needed as it stands to overtake Michael Holt, while he also moves up above Michael Wasley on the European Order of Merit as it stands. 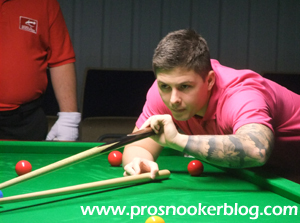 14:17 – Michael Holt has struggled for form of late and he has exited again at the first round here in Poland, losing 4-2 to Brazil’s Igor Figueiredo. Although Michael is already assured of a place at the Grand Finals through the Asian list, he now cannot improve upon 32nd position in the World Grand Prix list and would miss out on the new event in Llandudno if Fergal O’Brien is able to reach the last 16 stage this weekend. 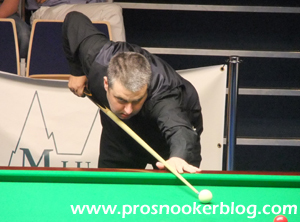 Next up for the Irishman will be Ryan Day, after he saw off Ken Doherty on the main table. 14:35 – One of the most significant results of the day there as Elliot Slessor loses out 4-3 to amateur Marc Davis on the pink, a scoreline which could prove to be the difference between Elliot remaining on the tour or not. 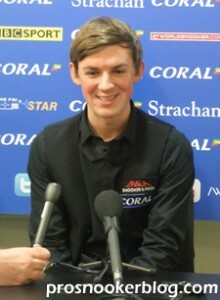 Had he been able to win that match, Elliot would have moved up above James Cahill and Stuart Carrington at the time of writing and into the top eight places of those who have no already secured a main tour card for next season, however with defeat, he now remains just outside of that group, with others below him still to play. All is not yet lost for Elliot, depending on other results between now and the end of the season, but as it stands, he would be relegated from the tour at the end of the campaign. 14:53 – Another important result for Michael Wasley, who has lost out 4-2 to the improving Steven Hallworth this afternoon. The result leaves Wasley effectively holding onto the 24th and final qualifying place for the Grand Finals and looking over his shoulder with players behind him winning matches. 15:18 – In more positive news however, our latest winner is Stuart Carrington, who has defeated Richard Beckham 4-0 to add a potentially crucial €583 to his Order of Merit total and move above both Allan Taylor and James Cahill in the race to earn a fresh two-year tour card from next season. 15:50 – Through to the third round and further cementing his place inside the top 24 on the European Order of Merit is Mark Williams, who defeated a limping Tom Ford 4-0 on the main table this afternoon. The result lifts him to 16th place as it stands which will surely be enough for the Welshman to be sure of his place in the Grand Finals now. 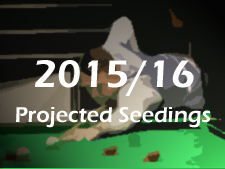 16:58 – So midway through the second round, what else is there to keep an eye on today? In terms of the tour survival battle, one man worth tracking is Alex Davies, who having received a first round bye following the withdrawal of Nigel Bond, needs to win two more matches to move into position to retain his place. 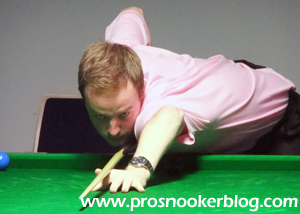 At the time of writing he leads Robin Hull 1-0. In terms of the Players Championship Grand Finals, Liang Wenbo is the main man to keep an eye on, as at the moment he is level with Robbie Williams at 3-3, despite having taken the opening three frames in that match. 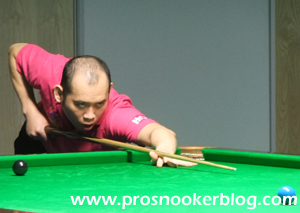 Victory against Williams would see Liang close the gap to the man currently holding the final place, Michael Wasley. And the man to watch in the Grand Prix race is Fergal O’Brien, who must defeat Ryan Day and then either Martin Gould or Gerard Greene to reach the last 16 to knock Michael Holt out of the 32 qualifying players as it stands. 18:14 – A potentially big win there for Alex Davies, who has put out Finland’s Robin Hull 4-2 to progress to the last 32 and take his European Order of Merit total to 2,000 points. In simple terms, he must now defeat Luca Brecel during his next match later this evening to claim a fresh two-year tour card at the expense of James Cahill, who of course lost early this morning. Elsewhere, Fergal O’Brien has defeated Ryan Day to also make the last 32 and further consolidate his position up inside the top 32. Another win is needed however, if the Irishman is to knock Michael Holt out of the top 32 qualifiers for the upcoming Grand Prix. 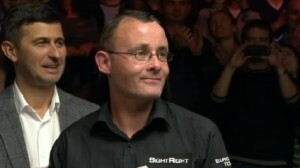 Next up for him will be Martin Gould. 19:09 – A 4-1 win for David Gilbert against Liang Wenbo brings Liang’s chase for a Grand Finals spot to an end this evening, in the process giving himself an opportunity of breaking into that group on Sunday. Next up for him will be Joe Perry, who today enjoyed a relatively trouble free run to the last 16. Meanwhile Stuart Carrington has consolidated his position in respect of the tour survival battle with a 4-2 victory against Steven Hallworth in the last of the second round matches. 19:48 – Unfortunately for Alex Davies, Luca Brecel has proven to be too strong for him in Gdynia this evening, running out a 4-1 winner to end Alex’s bid for a fresh two-year tour card for next season. The result means that for now at least, James Cahill holds onto the final top eight spot and in the first instance at least, will be hoping that Shaun Murphy can defeat Jak Jones tomorrow to give him a bit of breathing space. Of course, things can still change between now and the end of the season, meaning that Cahill will not know for certain whether he will retain his place until most likely after the World Championship qualifiers, but he will want to remain as high as possible to give himself the best chance. 20:22 – A 4-0 win for Mark Williams against Peter Lines sees him into the last 16 and surely cements his place inside the top 24 against of the Players Championship Grand Finals in Thailand. 20:59 – He gave it a good effort, but Ireland’s Fergal O’Brien has just fallen short in his quest for a place at the World Grand Prix, losing 4-2 to Martin Gould this evening in the match that he had to win. This means that for now at least, Michael Holt remains in 32nd place, with a run to the final/title required by somebody below him such as David Gilbert or Jamie Jones, if they are to edge him out. Fergal does though remain in contention for a place in the Grand Finals and will now have to sweat on other results tomorrow before he learns his fate. in the top 8. Joe Swail came back on tour like that a couple of years ago. 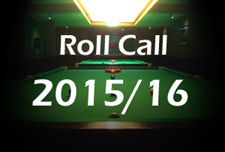 Or did world snooker change the rules again regarding to amateurs ? 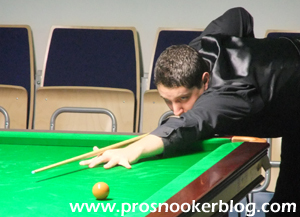 O’Sullivan (S.) has already qualified via the asian ptc order of merit. Sorry only just noticed this – yes he qualifies through the Asian list due to that having finished first chronologically. Like Donaldson last year, should have made that clear. Chris Wakelin is behind Fu on countback in the PC finals race, so I believe Fu is through to Thailand unless Dale and Higgins reach the last 8 this morning and Gilbert, Highfield and Carrington all reach the semi-finals. Wakelin will also be through unless 4 of these 5 events occur, which would appear to be very unlikely. If J Robertson reaches the final, Williams would qualify via the Asian OOM instead of him, so 25th on the European OOM would get through to the finals. Since Highfield and Gilbert would meet in the next round if both come back from 3-2 down King can be overtaken by only one of these, plus Carrington, so he’s sure to finish in the top 24.